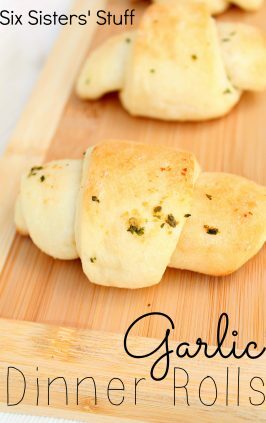 You can't go wrong with this Zesty Cheese Bread. 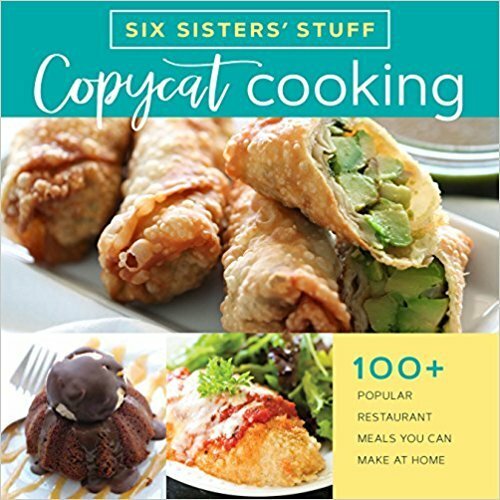 It's literally such an easy recipe and the perfect side dish for a meat entree, or a delicious bowl of soup and a salad. It comes together in less than 30 minutes. 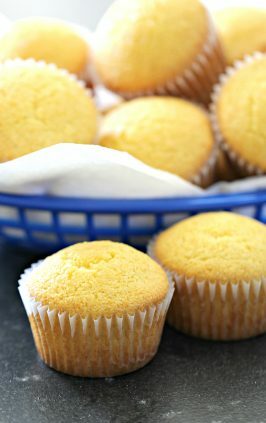 We love coming across a recipe that is a no fail. 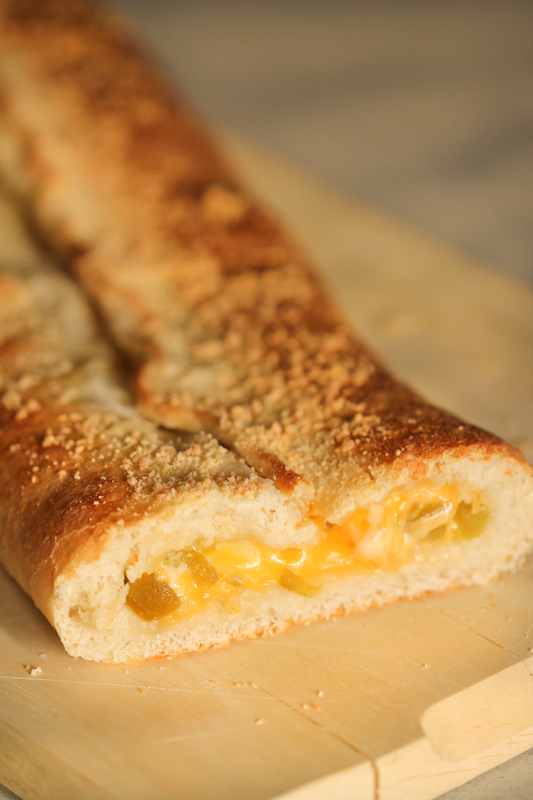 That is exactly what you’ll get with our Zesty Cheese Bread. 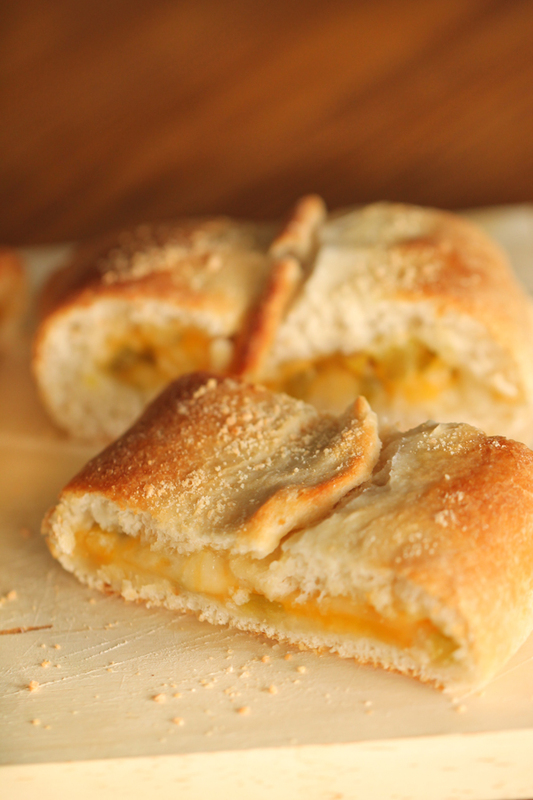 We followed the directions exactly as printed and came up with this yummy cheese bread. 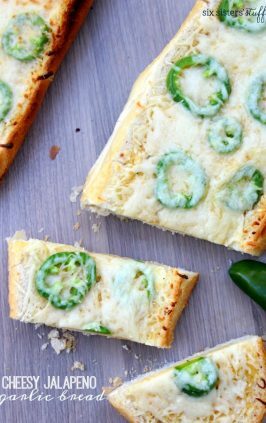 It’s a pizza crust that is loaded with cheese and mild green chiles. Then we topped it off with some grated Parmesan cheese. It’s the perfect side with any meat or pasta dish. We had it with a big bowl of soup. It can be a perfect side dish for just about anything you are having for dinner. And it comes together so fast with very little prep. Our mom has had a drawer full of recipes that she has wanted to try for years. We found this one buried in the bottom of the drawer. You can see from the date on the bottom of the recipe that it has been in the recipe drawer for 20 years, and we just now pulled it out. She cut it out of the USA weekend paper and the chef for this amazing recipe is Barbara Jones form Norristown, PA. Thanks Barbara for this amazing bread. 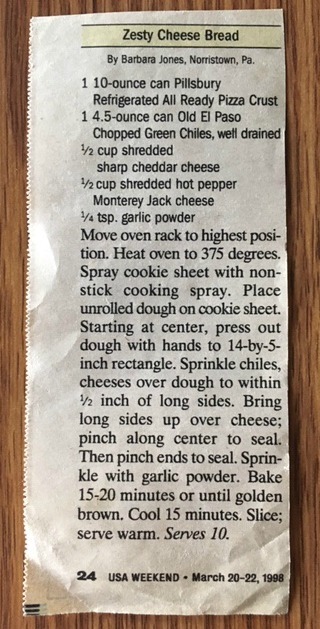 It’s been hiding in our recipe drawer for 20 years. You’ll see that it calls for Pillsbury Pizza Crust. That crust now comes in a 13.8 ounce package. We left the other ingredient amounts the same. You could add a little more cheese if you wanted. But we felt like the amounts in the recipe were just fine. We added grated Parmesan cheese on top. 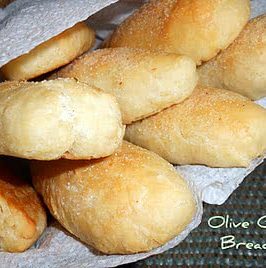 can you use homemade pizza dough? 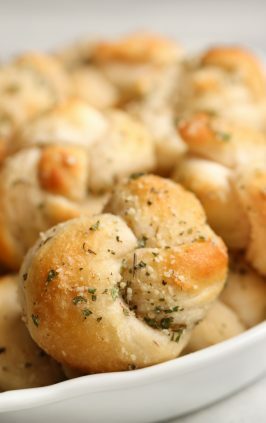 This recipe calls for Pillsbury pizza dough that has been premade. 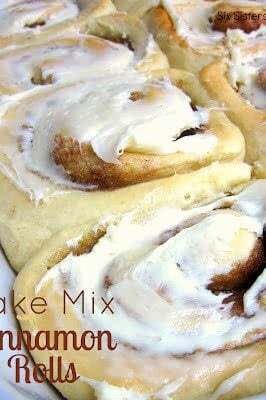 It works great and is delicious in this recipe. 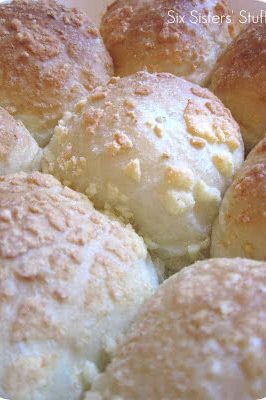 You could easily use a homemade pizza dough recipe for this Zesty Cheese Bread. You’ll want to be able to spread the dough in the cookie sheet to make the 14 x 5 inch rectangle. 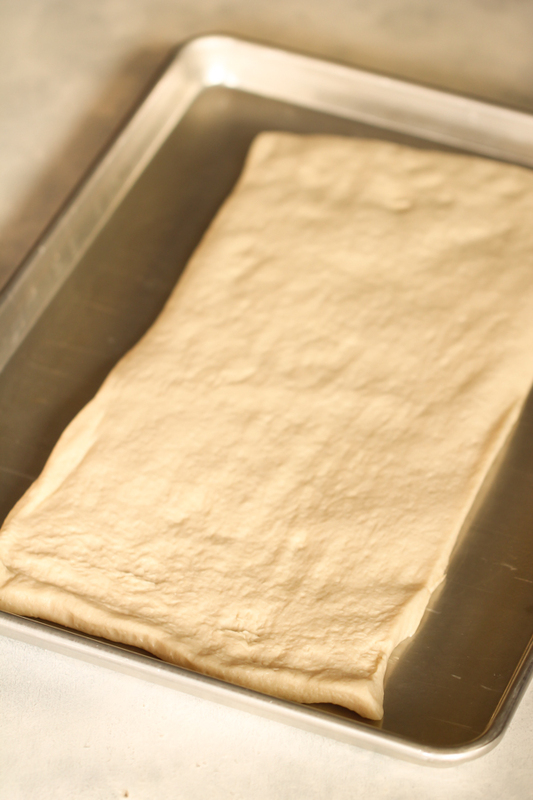 With the pizza dough package being a little bigger now (13.8 ounces) your rectangle will easily be bigger than 14 x 5. Ours was closer to 16 x 6. We added in mild green chiles, but you could add in some that have more heat to them. 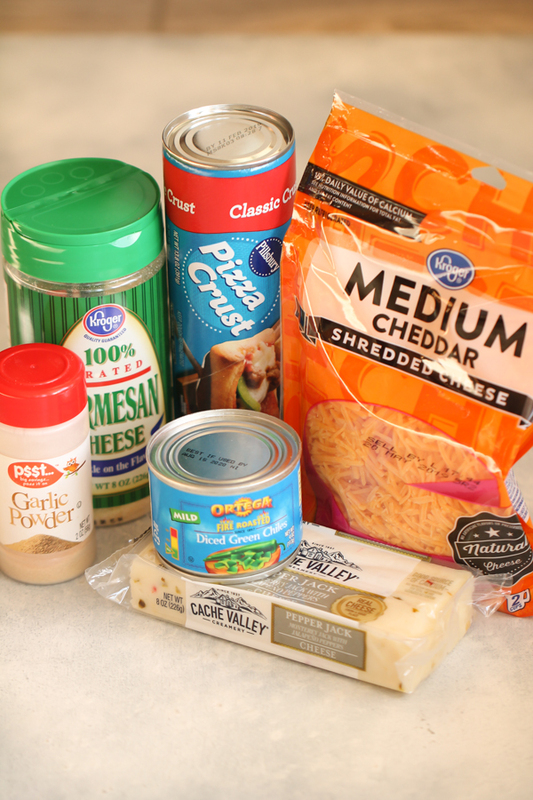 You could easily add in different flavors of shredded cheese. 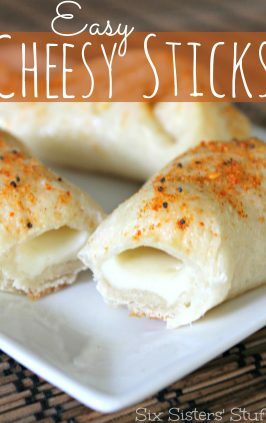 We love the kick from the shredded Pepper Jack cheese. It gives this bread just the right amount of kick. 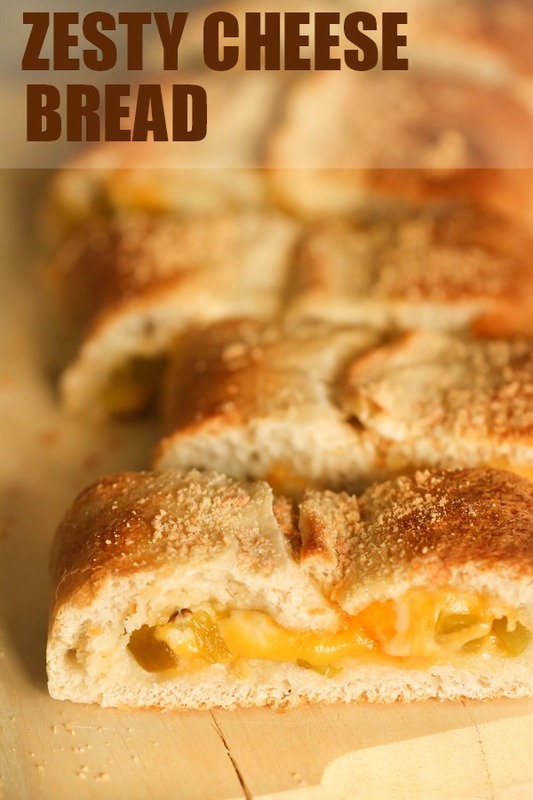 Small chunks of ham, pepperoni, or sausage would be tasty in this Zesty Cheese Bread. The options are endless. 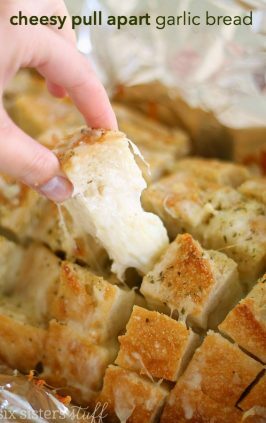 All you need are a few simple ingredients for this cheesy bread. Move your oven rack up a few notches. We didn’t put it right to the top or the bread would have touched the top of the oven. So we went up 2 levels. Heat the oven to 375 degrees. Spray the cookie sheet with non stick cooking spray. Place the dough onto the prepared cookie sheet and spread out with your hands to form a rectangle about 16 x 6 inches. 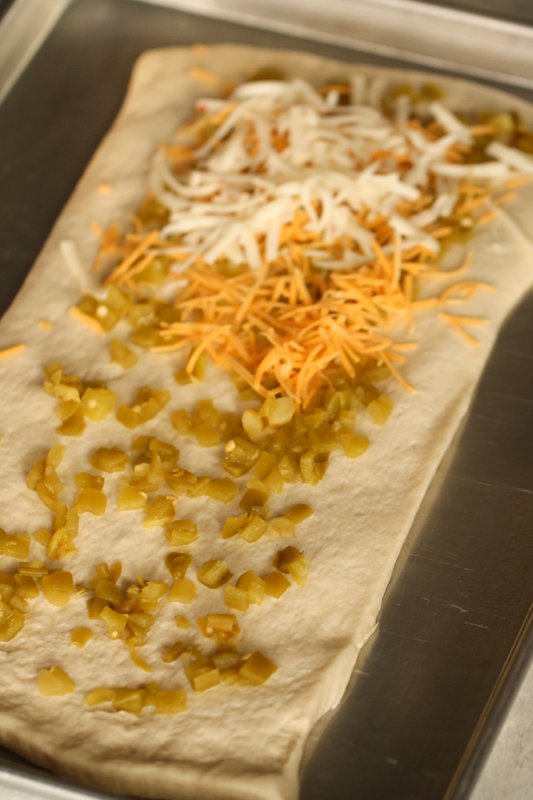 Sprinkle the drained chiles and shredded cheese over the dough. Leave about 1 inch around all 4 sides. Cover the entire crust. Bring the long sides in toward the center covering up the cheese. Pinch the dough along the center to seal. Sprinkle with garlic powder and Parmesan cheese. 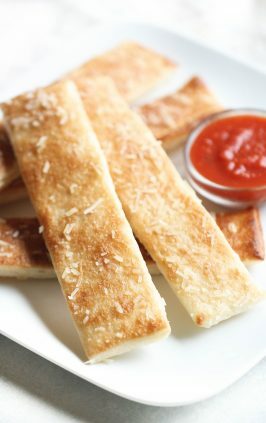 Bake for 15 – 17 minutes or until golden brown. Cool for about 10 minutes. Slice and serve warm. Cookie Baking Sheets – These cookie sheets are half sheet size and you get 2 for this great price. Can Opener – We love electric can openers. So helpful when you have a lot going on in the kitchen. Bread Knife – We love a sharp chef’s knife for slicing bread. 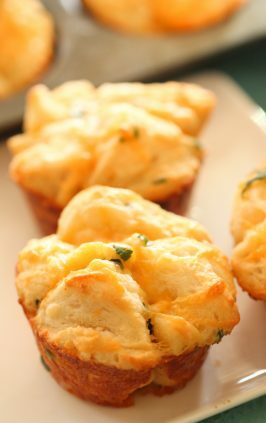 Here are some great recipes that go well with Zesty Cheese Bread. Move oven rack about 2 notches but not too close to the top. 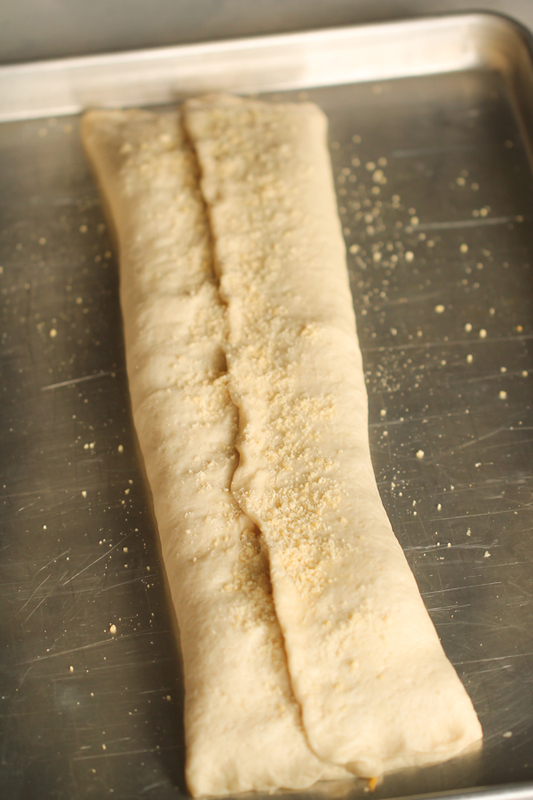 Place dough on cookie sheet and spread around with hands to form a 16 x 6 inch rectangle. 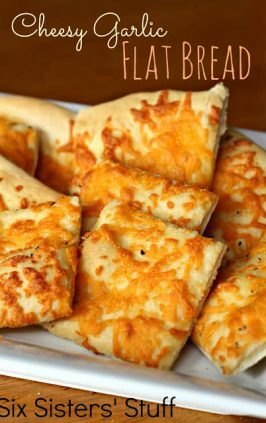 Sprinkle chiles and shredded cheese on the dough leaving a 1 inch border around the entire rectangle. Bring the long sides up over the cheese and pinch the dough along the center to seal. Also pinch each end to seal. Sprinkle top with garlic powder and grated Parmesan cheese. Cool about 10 minutes and then slice and serve. Watch how to make this Instant Pot Minestrone Soup that goes great with Zesty Cheese Bread.